City at night Nothing has the same look and feel as a dynamic city at night. The city at night, takes on a more urban character, and feel a bit more enclosed within this semi man made environment. The buildings, which felt like the sides of a canyon during the day, are more like walls at night. The lights, and everything else are continual reminders that you are very much inside of a built structure. The Sun is just starting to go down, as we see the outline of one of the older buildings, being reflecting in a comparatively new glass tower. People go our at night here, not just to drink, and carouse, but to shop, dine, take in a show, and visit. A view up Nicolet Mall at night. The contrast between the old church, the modern and brightly lit IDS Tower, and the assortment of other designs makes this as scenic, and cosmopolitan view as you will find in any city. The art deco appearance of the Wells Fargo Building, as it soars into the night sky, belies it's more modern heritage. Some random late night traffic on the mall. Still, things are beginning to wind down for the night. The night life tends to move on towards Hennipen. A look up the sidewalk, along a row of street lamps, and the sides of some of the mall buildings. Bright lights, big city. 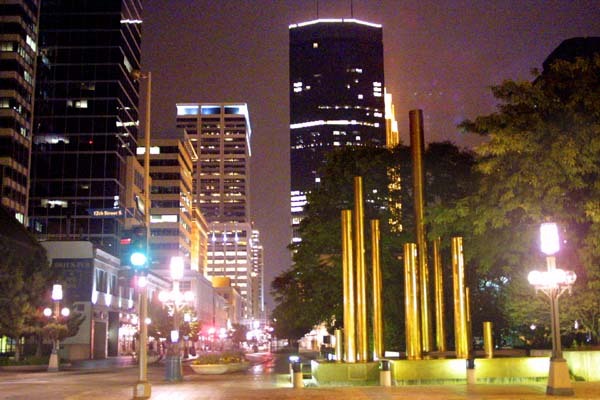 The IDS Tower, and the US Bancorp building shine at the top, while the Mall is illuminated by classically styled lamps at street level. A few blocks up, and the same two building loom off in the distance. A view South on Nicolet Mall. Brits is to the right, while the Hyatt can be seen off in the distance. Brits. A street level view of this traditional pub, with a score of colorful neon signs in the window. Looking north on Nicolet Mall, rather late at night. A look up towards the end of Nicolet Mall. Peavy Plaza is to the left, while the tower of the Westminster Presbyterian Church looks over the trees. We are looking south, towards the end of the Nicolet Mall. The mall takes a curve, and then ends at Grant Street. The beginning of the Loring Park Greeneway is directly across the street from the church. One of my favorite night shots of this city. The sculpture in the foreground seems to emphasize the vertical dimension of the skyline. A view North, up the mall, from the front drive of the Millennium Hotel. At the outskirts of the commercial areas, and starting to get into one of the neighborhoods, we see the IDS, and Wells Fargo buildings standing shoulder to shoulder. A church off on one of the side streets, which I am unfortunately unable to identify. If anyone is able to identify it for me, I would appreciate the information. A look down one of the residential streets of the Loring Park neighborhood. An apartment block, in the Loring Park area. Nearing the park, on a twisting little side street. A look across Loring Park, towards Nicolet, and downtown Minneapolis. The tower of the Basilica of St. Mary , looking like a peaked blue moon, off in the distance. The Berger Fountain, in Loring Park, appearing as if it is a wet dandelion. Part of the greenway which runs between Loring Park, and Nicolet Mall. Nearly to Nicolet Mall, along the greenway. The white structure, visible thorough the trees is the Westminster Presbyterian Church. The classic lines of the Westminster Presbyterian Church look magnificent at night. A bit of the Oakwood Apartments can be seen over the top.